This is an opportunity to participate in a joint venture with local owner of the leading golf club in Poland. The purpose of the proposed investment would be to develop a “gated” housing and resort facility contiguous to Gdansk Golf Club, the top rated golf course in Poland. 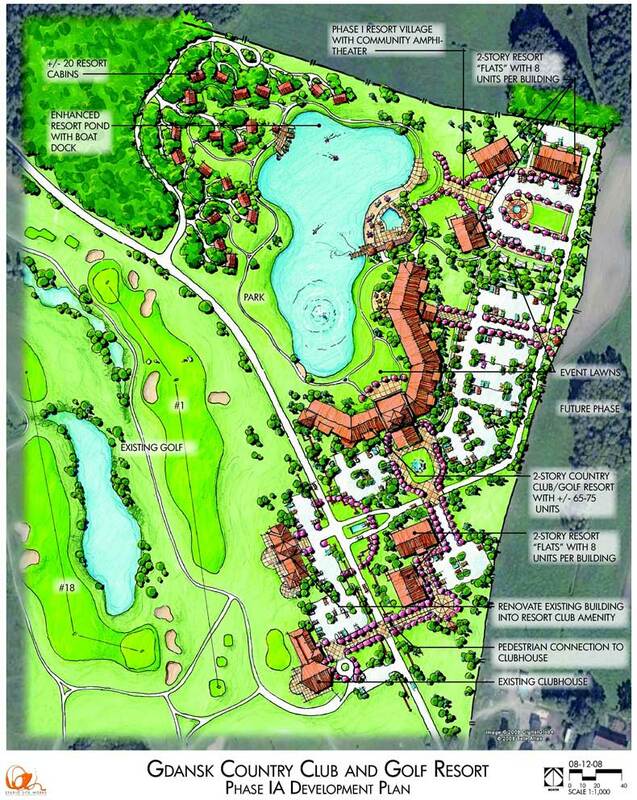 The development land now owned by the owner of the course would be combined in a joint venture with the objective of selling finished product and developed building lots. The Gdansk Golf Club is located 28km (18 miles) south from the Polish tri-cities of Gdansk, Gdynia and Sopot. The total population in a radius of 50km of the Club is approximately 1.3 million people. Gdansk GC (www.golf.com.pl) was completed in 1997 and sits on 100 HA (approx. 250 acres) of rolling forested terrain. It quickly ascended to the top of the list of golf courses in Poland and currently is unanimously recognized by GOLF Magazine, Golf Digest and Polish PGA as one of the top ranked golf facilities in the country. The club is located 20 minutes motorway drive to the Gdansk International Airport and 30 minute drive to the sandy beaches of the Baltic Sea. The Gdansk Golf Club and 70 HA (175 acres) of adjacent developable land is currently owned by an investor who is now seeking a joint venture partner to help to develop the project in three Phases. Investors would set up a corporation to develop the Gdansk Country Club and Golf Resort -Postolowo.There is an additional option to purchase between 75 and 85 HA of land (150 to 250 acres) for approximate € 6.5 million Euro. The Postolowo Golf Club would contribute to the joint venture his 70 HA (175 acres) of developable land surrounding the golf course. The joint venture would then control 70 to 170 HA ( up to 425 acres) in a single ownership vehicle for a master planned residential and resort community. Joint venture investors in this opportunity can anticipate receiving a 39% return on their investment over a 3-year period from partial development and sales of land to pre-approved builders and a resort developer. Alternatively, the Joint Venture can purchase, obtain government approvals and re-package the development to a vertical builder/developer for a 20% – 40% ROI in 18 to 24 months. The key leverage point to success of this opportunity is based on the JV’s ability to assemble key parcels into a critical mass of land. Certain portions of this land as those for bellow presented Phase I master plan are entirely controlled by the owner of the golf course and already permitted for residential and resort development. The available land for purchase is currently zoned agricultural. For a limited time (estimated 90 – 120 days), there is an opportunity to purchase the additional acreage with a valuation as agricultural land before the reclassification of these lands to residential and resort permitted is complete. There is an opportunity to redraw the zoning classification for the entire county. The area has been identified as a residential growth corridor for the region by county and city master planning initiatives. These plans are generally not well known to the public at this time, but Gdansk Golf & Country Club has received documentation that illustrates that the master plan has the strong support of the local and regional authorities. The Gdansk Golf Club is one of only twelve 18-hole courses in a country of 39 million people and the golfing population is growing at an average of 20% per year. GDP in Poland is growing at 6-10% per year over the last 10 years with personal income growing at a similar rate. Poland was up to to date the only country in the EU achieving constantly positive GDP. There are 17 million Polish people living abroad with an increasing trend of repatriation. More than 3 million Polish people are currently working abroad contributing five billion Euro a year to the inland monetary circuit increasing the consumption and investment spending of the nation. Additional information about this opportunity can be obtained by contacting the Reception Desk on office@postolowo.com or by phone +48586837100 . Additional information about Gdansk Golf and Country Club – Postolowo can be found at www.postolowo.com. Please click on the British flag for the English verbal communication version of this website.